Home > News > EWG News and Analysis > Why Does the Energy Department Downplay the Future of Renewables? 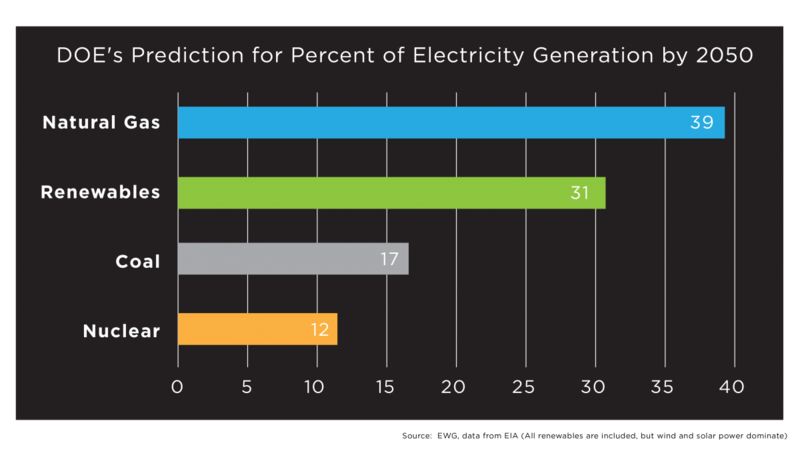 In 2050, the EIA predicts, natural gas and coal will still dominate the energy mix, representing 56 percent of all electricity generation. The agency says the expansion of wind power will slow down after the expiration of a federal tax credit, almost flatlining from 2021 to 2028. And it says the pace of shutting down dirty, aging coal plants – after a near-record number of coal plants were closed last year – will slow after 2033. One day after the release of the EIA forecast, one of the nation’s biggest utilities offered a forecast that could have come from a different planet. NextEra Energy is the nation’s fourth-largest electric utility, operating in more than half of the U.S. In a call with financial analysts, CEO Jim Robo said the cost of wind and solar power will continue to decline, and with advances in battery storage technology, the old sources will not be able to compete. A closer look at trends in wind energy shows how inexplicably pessimistic the EIA’s forecast is. According to a 2018 report by Environment America and Frontier Group, the cost of offshore wind for projects from the mid-Altantic to the Northeast has dropped by more than one-fourth since 2012. The report said the technical potential for wind exceeds total electric demand for most of the East Coast. In a column for The Hill, Dan Cohan, an associate professor of civil and environmental engineering at Rice University, said the EIA’s 2015 analysis predicted it would take 25 years for the U.S. to reach 20,000 megawatts of solar power. Instead, that benchmark was reached in two years. Cohan also noted that the EIA’s 2017 forecast predicted the cost of solar power would be double the price that had already been achieved a year earlier. Another problem with the EIA’s assessment is that it assumes there will be no change in energy regulations. That may be true on the federal level, but states like California and eight newly elected governors have set 100 percent renewable goals, as have more than 100 US cities. In addition, more than 160 large corporations have announced 100 percent renewable goals. It’s tempting to attribute the EIA’s downplaying of renewables to the Trump administration’s doomed schemes to prop up coal and nuclear power. But the agency’s attitude has been the same under previous administrations. The EIA’s institutional bias conforms to the federal government’s longstanding support for an all-of-the-above energy policy that seeks to keep dirty, expensive 20th century sources of power operating alongside clean, safe, affordable renewable energy. But these resources are, by and large, incompatible. Maintaining coal, nuclear and natural gas in the energy mix only slows the march to 100 percent renewables and increases the cost of the transition.